SEOUL, South Korea, August 6, 2014 (ENS) – How can used cigarette butts contribute to the development of superior electric vehicles? South Korean researchers have found a way. Five scientists from Seoul National University’s College of Engineering have converted used cigarette filters into a high-performing material for supercapacitors that could be integrated into electric vehicles to store energy. Unlike batteries that offer limited charging/discharging rates, supercapacitors require only seconds to charge and can feed electricity back into the vehicle’s air-conditioning system, GPS, radio, and other devices as needed. Publishing their findings August 5 in the Institute of Physics Publishing’s journal “Nanotechnology,” the scientists say they have demonstrated the material’s superior performance compared to commercially available carbon, graphene and carbon nanotubes. 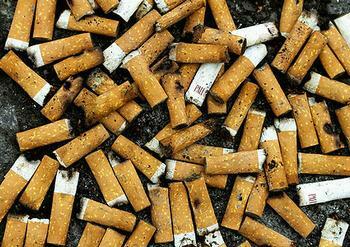 They hope the material derived from cigarette butts can be used to coat the electrodes of supercapacitors – electrochemical components that can store large amounts of electrical energy – while also offering a solution to the growing environmental problem caused by trillions of used cigarettes filters discarded annually. Scientists around the world are currently working towards improving the characteristics of supercapacitors, such as energy density, power density and cycle stability, while reducing production costs. As compared to the basic electrostatic capacitor used to tune radio frequencies, the supercapacitor is ideal for energy storage that undergoes frequent charge and discharge cycles at high current and short duration. Carbon is the most popular material that supercapacitors are made of, due to its low cost, high surface area, high electrical conductivity and long-term stability. In their study, the Seoul researchers demonstrated that the cellulose acetate fibers of which cigarette filters are made could be transformed into a carbon-based material using a simple, one-step burning technique called pyrolysis, conducted in a nitrogen-rich environment. Used cigarette filters from Marlboro Light Gold, Bohem Cigar Mojito and The One Orange from the Korea Tobacco & Ginseng Corp. were collected. They were pyrolyzed for two hours in an atmosphere of argon and NH3, a colorless, pungent gas composed of nitrogen and hydrogen. The carbon-based material resulting from this burning process contained both tiny nano-pores and medium-sized nano-pores, increasing its performance as a supercapacitive material. “A high-performing supercapacitor material should have a large surface area, which can be achieved by incorporating a large number of small pores into the material,” said Professor Yi. The porous carbon material developed by Yi and his colleagues spontaneously contains both micropores, with pore diameters of less than two nanometers, and mesopores, with pore diameters of about 25 nanometers. “The unique self-developed pore structure allowed a favorable pathway for electrolyte permeation and contact probability, resulting in the extended rate capability for the supercapacitor, said Yi. “A combination of different pore sizes ensures that the material has high power densities, which is an essential property in a supercapacitor for the fast charging and discharging,” he said. Once fabricated, the carbon-based material was attached to an electrode and tested in a three-electrode system to see how well the material could charge and discharge. The material stored a higher amount of electrical energy than commercially available carbon, the researchers found. It also had a higher storage capacity compared to the graphene and carbon nanotubes reported in previous studies.